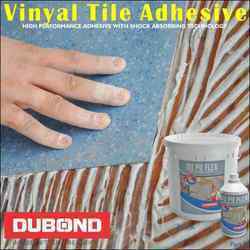 Dubond Tile adhesives can be used for fixing all types of tiles and stone over various substrates. 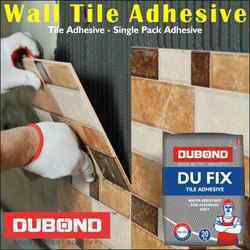 These Tile Fixing Adhesives are ready-to-mix, self-curing, and with excellent adhesion properties. Their superior bond strength prevents shrinkage cracks and slippage of tiles. 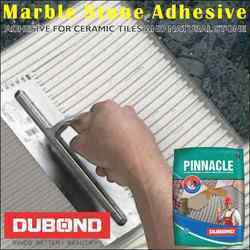 We are giving best tile adhesives. Choose from a range of products for tile on tile applications, heavy-duty applications, external cladding, wet and dry areas, internal and external applications. 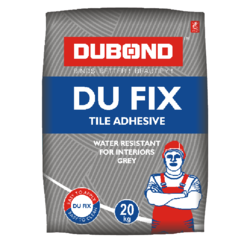 Dubond's Du Fix is a quartz based tile adhesive that has excellent results for high resistance laying of ceramic tile on floor, walls on cement based substrates. It is workable upto 10mm thickness and the formulation ensures optimum- performance for tile setter. It is absolutely reliable and has its base in superiority of its conception. One pack adhesive just add water. Designed for floors, walls, interior application, etc. We are leading supplier of Construction Adhesive. Dubond's DU FLEX - Grey is a special purpose, two component high adhesion product with performance elasticity. It has anti skid properties because of the presence stabilized polyurethane and micronized pure mineral fillers. Du flex secures the laying on high deformable and high expansion substrates, finds base in DU FLEX technology and is recommended for laying tiles, glass mosaic, water absorbed, marbles, natural stones on surfaces (porous) concrete woods and nonporous surfaces such as glass or metal. 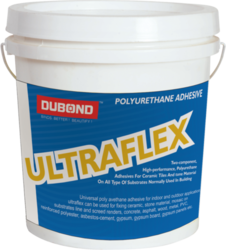 Dubond Ultraex is two-component solvent and water free adhesives which are exible and waterproof. They are made up of a polyurethane base (component A) and a special hardener (component B). Dubond Ultraex is an improved (2) reaction resin adhesive (R) and slip resistant (T) classied as R2T. Excellent durability and resistant to ageing. Perfect adhesion on all surfaces used in building. Hardens by chemical reaction without shrinkage (until it becomes highly resistant). In the case of Ultraex, highly thixotropic: it can be applied vertically without slump and without letting even heavy or large tiles slip. Fixing wall and oor tiles indoors and outdoors. The tiles can be made of: Ceramic, stone material and mosaic. Fixing on screeds, renders, concrete, asphalt, wood,metal, PVC, reinforced polyester, asbestos-cement, gypsum, gypsum board, gypsum panels etc. Bonding ceramic tiles, stone material and all types of mosaic in showers and on sheets used for prefabricated bathrooms. Bonding ceramic tiles and mosaics on wooden work surfaces or in kitchens in order to achieve a waterproof substrate. Bonding ceramic tiles, stone material and mosaics on balconies, external terraces domes or at roofs subject to foot trafc. Bonding natural stones and reconstructed stone (marble of every t ype, slate etc.) also subject to movement and size variation due to the absorption of water (class C of size stability according to DUBOND standards). Bonding ceramic tiles and stone material on surfaces subject to vibration and deflection. Tiles must be absolutely dry. Apply firm pressure to the ?les to ensure good contact and covering of the back. If the layer of fr esh Ultraflex is also to act as a waterproofing membrane, make sure that any ribs and lugs do not go through the layer. If Ultraex is used for installing on particularly deformable substrates, all coverings larger than 5x5 cm must be installed with wide joints. The open time of Ultraex under normal temperature and moisture conditions is approximately 50 minutes. Any adjustment must be carried out within 90 minutes of installation. DUBOND'S PEAK - White is a no slip, high adhesion quartz adhesive. It can be applied upto 10 mm bed thickness. High dispersion copolymers hydraulic binders composed of only cement clinker in PEAK provides rheological mixture for a prolonged stability. It serves purpose of high resistance laying on flooring and wall of ceramic and homogeneous tiles and glass mosaic on cement based substrates. * Fixing absorent floor and wall tiles outdoors and indoors. The tiles can be made of cotton, double fired, single fired ceramic. * Fixing poorly absorbent materials or non-absorbent materials such as single-fired tiles, refine porcelain stoneware and vitrified tiles. * Suitable for use when high performances are required, such as tile fixing in industrial environment or fixing on top of old ceramic tiles or natural stone indoors, in swimming pools or on facades. * Fixing on heating floors. Being one of the reputed organizations in the market, we are engaged in providing an exclusive range of Floor Tile Adhesive. 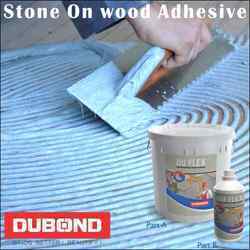 Dubond's Pure is a quartz based tile adhesive, that has excellent results for high resistance laying of ceramic tiles on floor, walls on cement based substrates. It is workable up to 10mm thickness and the formulation ensures optimum-performance for tile setters. It is absolutely reliable and has its base in superiority of its conception. Designed for ceramic floor and wall tiles for outdoor and indoor. The tiles can be make of cotton, double fire, single fire, ceramic . Dubond’s Du Pu Flex is a professional,superior-technology, two part polyurethane system with high elasticity and skid property , suitable for high- resistance laying on flooring and wall of homogeneous and ceramic tiles, glass mosaic , large- size tiles, humidity sensitive marble and natural stone, on deformable and also non- absorbent substartes, wood and derivatives. Du Pu Flex technology ensures superior- performance adhesion for laying ceramic tiles and natural stone on porous surfaces such as glass or metal. Du Pu Flex provides balanced thixotropy and superior-performance elasticity ensured by the use of stabilized polyurethane resins and micronised, pure mineral fillers, for rapid and secure laying operations on high deformable and high expansion substrates. Fixing ceramic tiles of all types to difficult substrates or ones liable to considerably warp. Fixing natural stone sensitive to humidity, composite marble. keep to the mixing ratio of 700 gms : 500 gms . For partial mixing, weigh the two parts precisely workability times may vary considerably, depending on environmental conditions and the temperature of the tiles. Packaging Details: 7.5Kg base bucket & 2.5Kg hardener bottle. Dubond’s Pinnacle is a high- tech single part adhesive with superior levels of adhesion and deformability. It is high performance dry set adhesivefor use with water or latex for installing ceramic tiles, marbles, stone , any kind of porous and vitreous tiles or synthetic stone. It has a special function that works specially to cunter conditions such as external pressures on cladding tiles of the skyscrapers and large format tiles with over laying on existing floors.